Dull, inanimate, and invoking complete boredom is probably a common first impression of musicians glancing at the average finance journal. Unless you are deeply immersed in financial markets, papers like the Wall Street Journal or the Financial Times are not your preferred reading material. Every now and then however, there are moments of glory when music and finance come together in the form of an article that speaks to both left brain and right brain. One of these moments was the highly anticipated interview of Stephen Fry with Lady Gaga in this week-end’s edition of the Financial Times. If not for Lady Gaga, do yourself a favor and read it anyway. Stephen Fry, a “quintessentially English” actor, who also happens to be a fascinating writer well-versed in the subtleties of sarcasm, always leaves an impression and a smile on your face. How could that be possible one might ask. A major recording artist running out of money, going bankrupt? In Lady Gaga’s case, the scary part from a financial perspective is the fact that she was technically bankrupt and “she didn’t know.” Granted, things get slightly more complicated when you have to manage a larger pile of money and essentially run a multi-million dollar business. But there is no excuse for “not knowing” at least a rough ball park figure and to put a stop on spending sprees before it is too late. When Lady Gaga says “It’s honestly true that money means nothing to me” take a moment and consider the validity of her statement. It sounds like the most often quoted lie of successful people. Money always means something to them or else they would not spend much of their waking hours accumulating more of it. The value of money just has different meanings to different people. To someone living on the streets, $5 could mean the difference between having a meal for the day or going to bed hungry. To a young billionaire like Mark Zuckerberg, founder of Facebook, the difference between $5million and $10 million might cause him nothing more than a lame yawn. No matter who you are, whether you live on the streets or in a $30 million mansion, the rules of personal finance apply. If you can remember to spend less than you earn, you will get financially ahead! As for Lady Gaga, she should consider learning the basics of personal finance. She could start by reading Money Music 101. Would someone kindly recommend it to her? 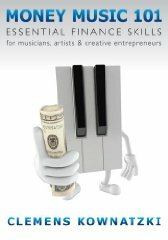 Money Music 101 is now available as eBook on Kindle. Money Music 101 is now available on Amazon UK as well as Amazon Germany!